I’ve learned a lot of lessons making quilts, and I’d like to share one now. While my opinions are just that, opinions – and rather biased ones at that – I’m hoping that someone can learn from my mistakes. Or at the very least be forewarned before falling down certain rabbit holes. I’m an avid hand quilter, and have been for over 20 years. I learned to quilt (queue blurred focus, rolling fields, and sentimental music) from Mennonite ladies in Central Pennsylvania – no kidding. They had their ways of doing things, and I quilted in a relative vacuum in my home in New York City for several years, before I realized that there were other ways. 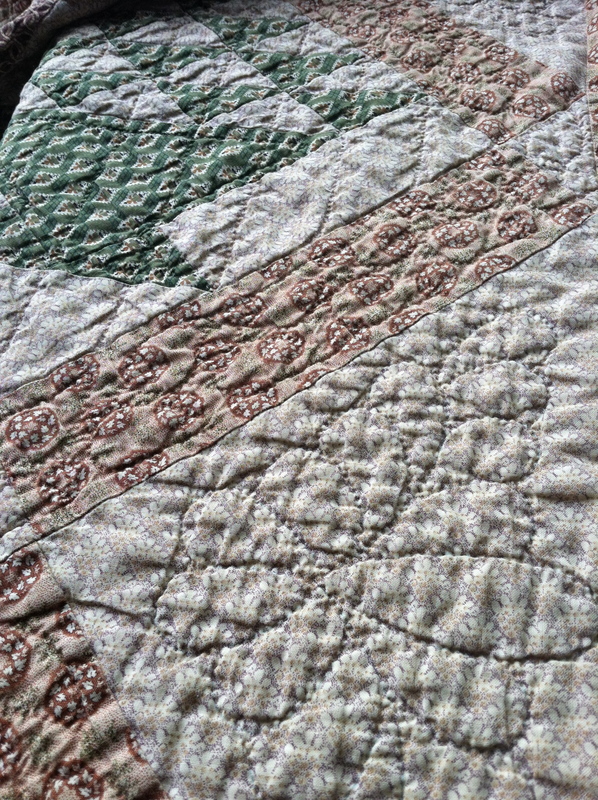 At the time I made it, this was my idea of a reproduction quilt – I used mostly (but not all) “authentic reproduction” fabrics and wanted something old-fashioned looking. To me, that meant heavily hand quilted. If you look at the corner triangle, above, there’s an elaborate feathered corner motif – a stencil was used for that. 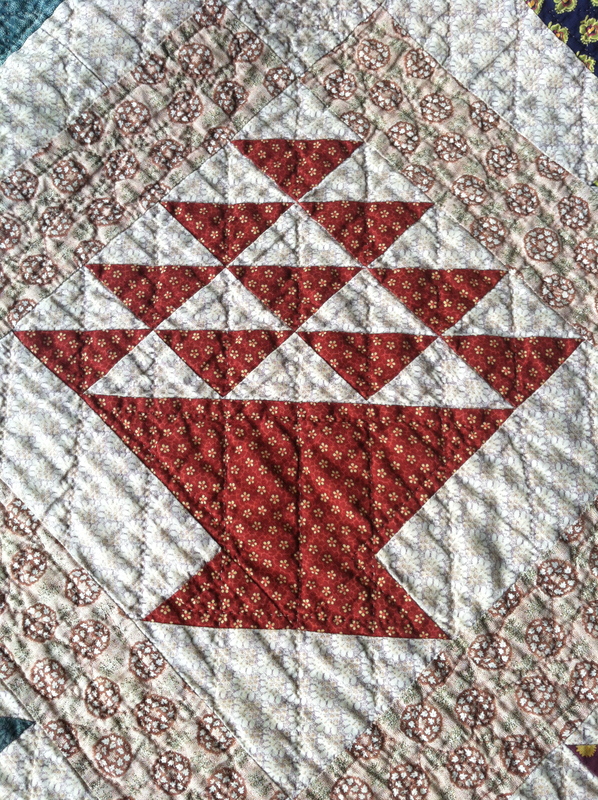 As I recall, the quilt was basted and partially marked by the Mennonite ladies who were friends of mine. When I took it home to quilt it, I did have some decisions left to make for quilting designs, and that was when I fell down a certain rabbit hole. 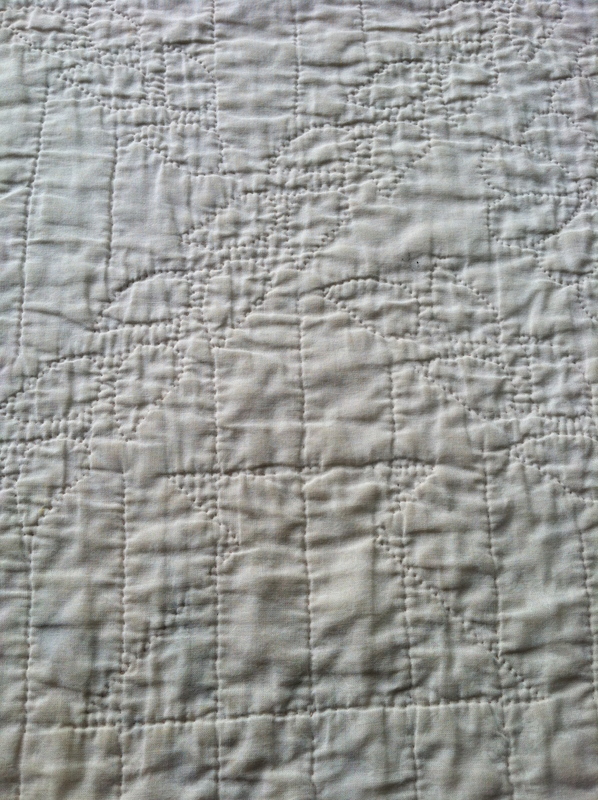 The sashing fabric, seen above, is extremely high contrast. There are black pointillist dots, white areas, dark green, medium brown, dark brown. There’s so much going on there that it became very, very difficult to find a marker that I could see, on this fabric that was used throughout the quilt. Tip #1: Figure out when the quilting is going to count. After much trial and error, I finally wound up using a permanent, acid-free fine point marker in brown for the sashing areas. You may be able to see just the faintest trace of the marks in the above picture, but you may notice that you cannot pick out the design. And trust me, there’s definitely a design in there. Seen from the wrong side, you can catch the detail of sweet little paisley shaped leaves, climbing vine-like through the sashing. 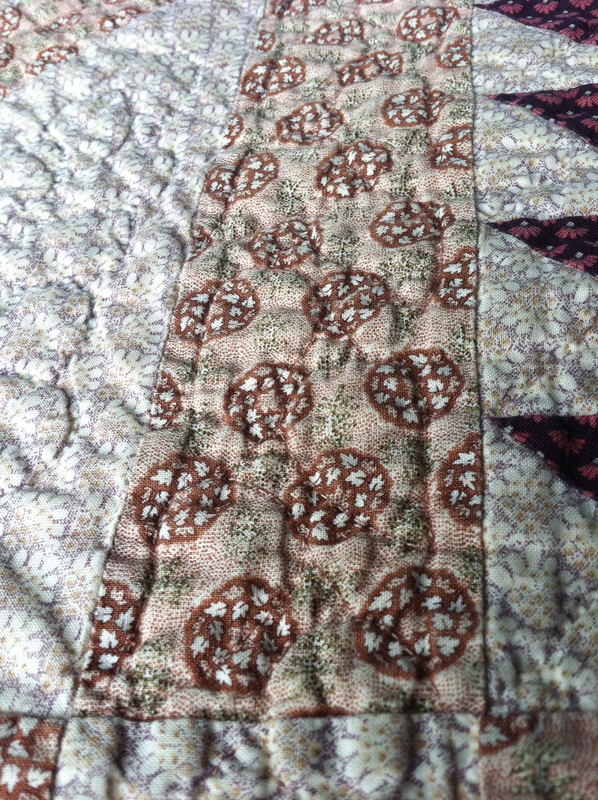 My rationale – and yes, I rationalized a whole lot on this one – was that it was “just for me” and I was going to see the quilting on the back of the quilt. Because the back of the quilt was plain white. Tip #2: It’s very rare that you look at the back of a quilt. As you can see, there’s a general … sense of quilting. 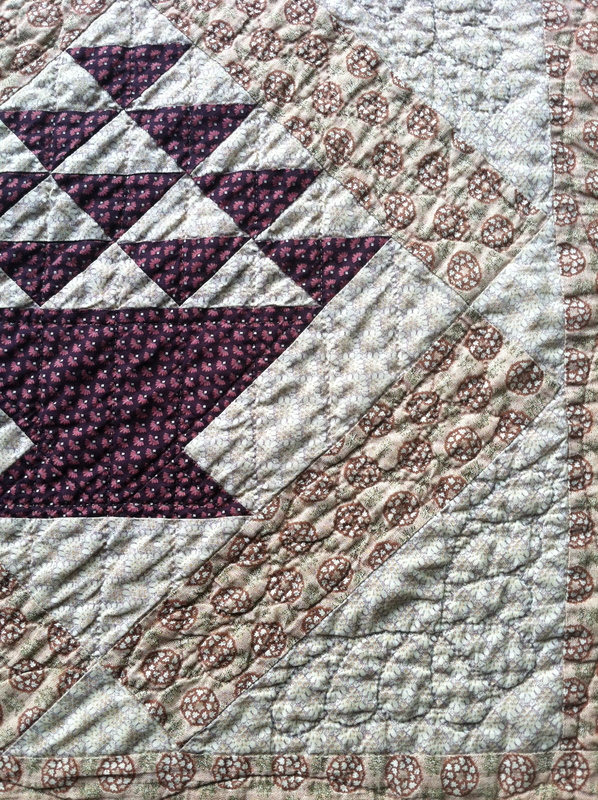 Some details visible in the side triangles, and some textural effect in the sashing. But really and honestly – that’s it. 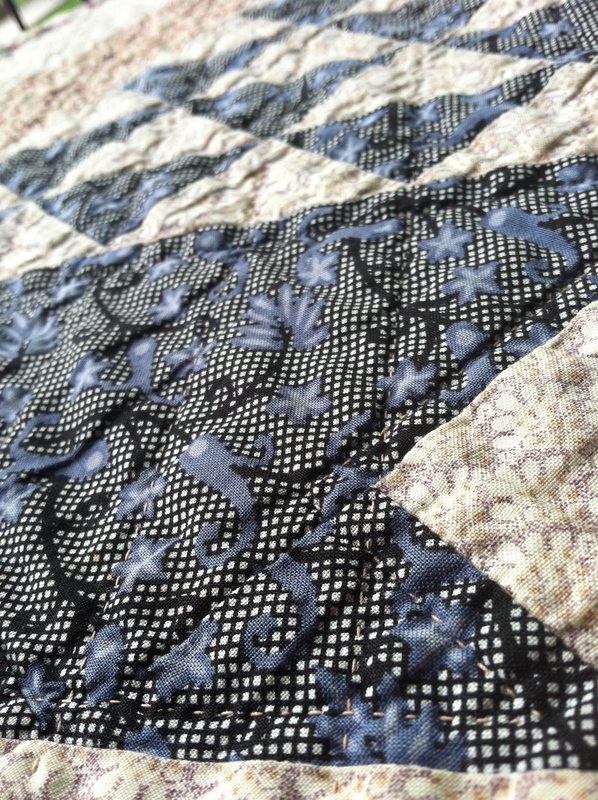 Textural detail that doesn’t translate to near the amount of work I put into marking and quilting that sashing. 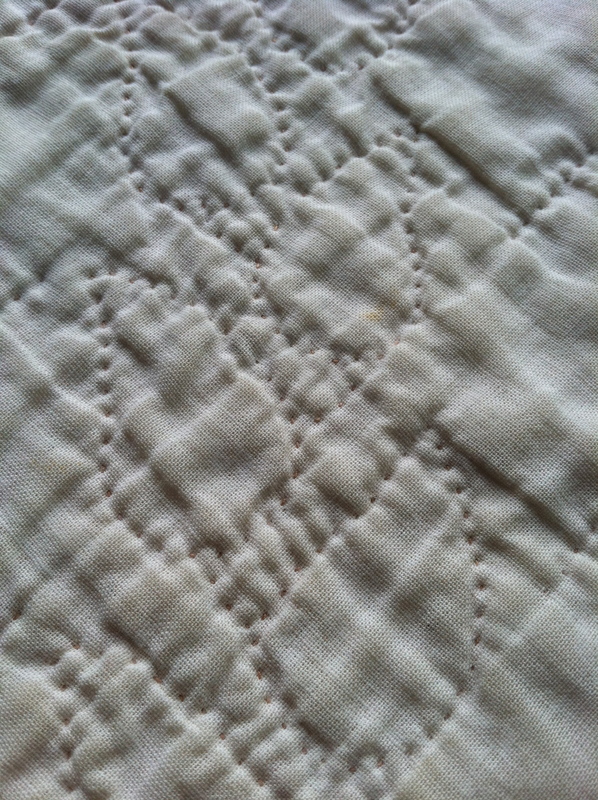 Tip #3: If you can’t see the marks, you won’t see the quilting. Again – high contrast black/white/periwinkle fabric. See those quilting stitches? Not much, really. They’re there, but at least in the case of the baskets themselves I stuck to simple straight lines. Easy to mark, quick to quilt. I think I’ve made my point(s). While I protested – too much – and justified my work to the nth degree, in the end what shows is basically just texture. As a hand quilter, I’m all about the texture and the detail, but I learned some really valuable lessons here about when to put the time in on something. These days I prefer to put my quilting in where it’s really going to count. I really enjoyed hand piecing. So much more control over your points than with a machine. I should give it a try again someday. Kim, you really should. Definitely a different pace, but still very satisfying. Makes sense, of course. I suppose if you wanted to, though, you could call it reversible and sometimes put the white side up on your bed and then it WOULD show. I also thought, “Oh, the back can be turned right side up whenever I want.” In fact, the back is boring and plain, and it just doesn’t reverse well. I’ve made other quilts that I definitely use “wrong” side up sometimes. This one just doesn’t look very appealing from the wrong side, in spite of all. that. quilting.